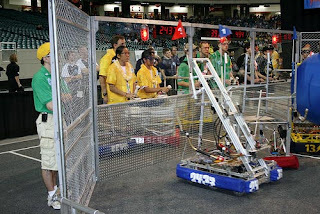 FIRST (For Inspiration and Recognition of Science and Technology) Robotics held its annual Florida regional competition at the UCF arena last weekend. A total of 60 teams of high school students and supporters from around the nation competed for placement in the championship in St. Louis April 27-30. 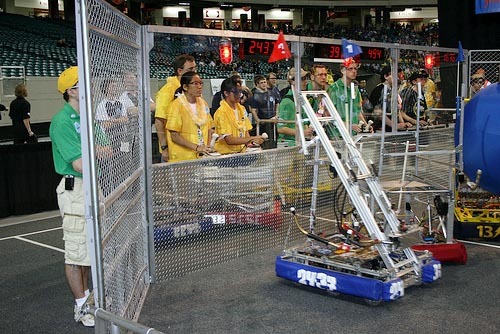 Large groups of wildly themed multicolored teams supported by mentors and family, cheered their teams robots, and point scored during the game itself. Each team was only given six weeks to prepare for the specific tasks required by this year’s competition. The game this year is called “Logo Motion” where teams have three goals to achieve with multiple robots. The majority of the game involves picking up and placing inflatable symbols from the FIRST robotics logo (a red triangle, white circle, and blue square) on metal hangers. Bonus points are awarded for an initial fully autonomous round, where the human drivers are not allowed to touch the controls, proper placement of the inflatable symbols, and even a secondary detachable mini-bot race, up an eight foot poll, at the end of each round. Besides inspiring young high school students, several college students participate as mentors and advisers. Many of them can be found in the work area backstage where teamwork and offering assistance to other teams is another major message of the entire organization. Participants are exposed to vital employment groups in the Orlando area with major involvement from NASA, Locke-Martin, Walt Disney, and other major corporations. FIRST robotics is a great organization to become evolved with for anyone looking for high-paying engineering and technological -themed jobs in the future.